Mr. Factoid's Sports World is a semi-daily sports blog dedicated to bringing sports lovers together to discuss all things sports. The site will feature updated news, stories, videos, ladies, and opinions. Plus, we have up-to-date betting lines available for our risk takers out there. Around here, I call it like I see it, whether anyone likes it or not. If you want to discuss a topic, and it hasn't been covered, shoot me an email(easports8009@gmail.com), and I will find time to post about it. This my friends is Ukrainian fitness model Natalia Muntean. According to her Twitter profile, she's a very accomplished young lady, having one Miss Bikini Universe 2009 and several other prestigious awards in the field. I'm loving the abs and pigtails myself, but I'm sure all you hound dogs will have your own thoughts on this beauty. Check out her website (http://www.bodybynatalia.com/) if you're looking for some fitness tips . There was time when Vince Carter was the king of the NBA skies. The man could finish with ease and grace, but that VC vanished some time ago. Now fans are left watching the shell of Half Man, Half Amazing, and to be honest it's not pretty to watch on most nights. The mess in New Orleans that is BountyGate got a bit worse yesterday when audio went viral of former team defensive coordinator Greg Williams. Williams, as you will clearly hear discusses taking out Frank Gore, Alex Smith, and Kyle Williams of the 49ers before the two teams were scheduled to play. This audio was recorded by Sean Pamphilon, a film director who had access to the Saints lockeroom while shooting a football documentary. Pamphilon initially served up the audio footage to Yahoo Sports. I warn you that some of the language is offensive. Williams is facing an indefinite suspension from the league and commissioner Robert Goodell, so I find it hard to believe that Goodell will be merciful in the future. I really don't know what to make of the situation in Orlando these days with Dwight Howard. Each passing day provides some new wrinkle about the all star center and his desire to either stay in Orlando or take his game elsewhere. Last night on TNT's Inside The NBA, Chuck and the gang talked in depth about Howard, head coach Stan Van Gundy, and the state of the organization. Check it out. * Was there a head basketball coach in the country under more pressure to win a National Title than John Calipari? I honestly don't think so. Consider all that he had accomplished heading into Monday night's game against Kansas. The resume of the man was already superb, but it lacked that final piece. He hadn't been able to close the deal with UMass or Memphis, two teams that arguably overachieved under his watch, but this time his team was favored by a mile and a bit. 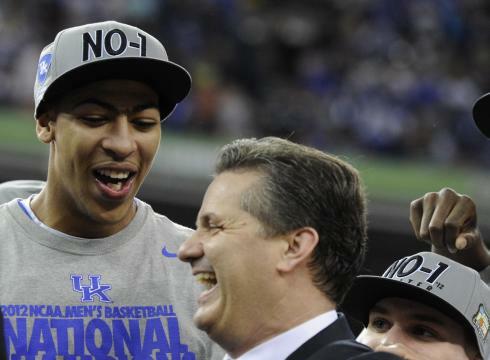 It was expected from the time the season began that Kentucky would cut down the nets in New Orleans, but banking on Coach Cal was somewhat risky. So where did that leave us? It left us with a team of young studs with immense talent and a coach who hadn't proven himself capable in the big game. When the final buzzer sounded and the Wildcats celebrated a remarkable run, there was Calipari, a man who hadn't been able to get over the hump, basking in the glory of finally finishing on the winning side of a National Title game. They say all it takes is one championship to solidify yourself among the ranks of the greats, and while I don't know if that is true, I do know that John Calipari never has to listen to criticism about winning the big game again. I found it fitting and somewhat ironic that Calipari defeated Bill Self, the man who's Kansas Jayhawks snatched the crown away from him in 2008. * What should Anthony Davis do now? The young man was the MOP of the Final Four, won numerous all-america honors, and demonstrated just how dominant of a defensive presence he can be. Most observers believe that Davis should go to the NBA now, and while I understand how that could be the opinion of many basketball fans, I disagree. Yes, he averaged a double-double in his freshman season (12.2 ppg and 10.4 rpg), and shot over 62% from the field. Yes, he blocked more shots than any freshman in SEC history. And yes, he played for a coach who has adopted the "one and done" format as part of his recruiting efforts. If you listen to the 'experts' the writing is on the wall, but going pro for Anthony Davis can wait. It's my belief that Davis can improve on the college level first. He's a kid that is still growing into his own body and learning what it takes to be a center. It was well documented that he sprouted from 6'2" to 6'11" in just two years. Imagine how much of a force he will be playing the position for another season or two in college and then entering the NBA. I can't imagine anyone being upset with a kid strengthening his IQ for his position. I'm also not sold on Davis offensively at this stage. I would love to see him develop an array of post moves before going to the league. It's great that he can catch alley oops and finish tip dunks around the rim, but what about adding a hook shot with the left and right hand? How about adding a solid up and under when the defender takes away the first option? How about adding a consistent 15 foot jumper? What would be wrong with all of these things? The answer is absolutely nothing. While everyone wants to rush kids out of school, let's make a collective push for some of them to stick around. I understand that Davis has to take the money if it's presented for him, and it would be foolish not to, but in my opinion his game could use a little seasoning salt. It needs a little more flavor if he wants to make an impact in the NBA right away, versus being a top pick who develops at the end of the bench. * Major League Baseball's endless season got under way Wednesday night down in Miami. My hometown and defending World Series Champion St. Louis Cardinals defeated the new Miami Marlins 4-1 to open the beautiful new park in Miami. The start of the baseball season means summer is approaching, something this Midwest native can't wait for, but there are just a couple of points I want to make about Miami and their new facility: (A) I'll never be able to fathom how ownership tricked the city of Miami to invest in a new stadium. The Marlins have continually found themselves towards the bottom of the MLB attendance ladder; (B) While it's the hot new ticket and attraction in town, don't expect folks to pack the stadium like they did tonight for long. Miami has the NBA's "Big Three" playing in their city, but last season LeBron and company had to beg fans to arrive early for games and stay until the end. Do you really think they'll be lining up for baseball? I think not. The opening day crowd will be the largest Miami sees all season. * Will you watch the Masters this year? Well I don't know if you will, but you should. For the first time in two years Tiger Woods appears to be a legitimate contender to win the prestigious green jacket. Woods is coming off his first tour win in eons at the Arnold Palmer Invitational two weeks ago, and finally seems to have his confidence and game back. The one thing that we all can agree on, whether you like Tiger or not, is that when he plays and plays well, the PGA Tour prospers. Now while Tiger is back and ready to chase down "The Golden Bear" for career major championships, his isn't the only story of note. Rory McIlroy returns from a his improbable collapse last year and seeks a bit of redemption of his own. The 22-year-old shot the worst round in history by any professional golfer leading after the third round of the Masters last year, a bit of history I'm sure young Rory would love to forget. McIlroy went on to win the U. S. Open in 2011, and for a short while this year was ranked #1 in the world. For him, this year's Masters may be more about exercising demons come Sunday than anything else. The field is wide open this year, and quite frankly anyone can win, so here are a few names to keep a look out for on the leader board; World # 1 Luke Donald, World #13 Adam Scott (Stevie Williams is his caddie), World #4 Hunter Mahan, World #11 Jason Day, and one of my personal favorites, World #23 K. J. Choi. While it's hard to pinpoint a winner at The Masters, the gentleman I've mentioned have as good a shot as any. The career of Vince Young has been a roller coaster ride since he lead the University of Texas to the BCS Championship over USC in 2006. He's gone from franchise quarterback to be released by the Tennessee Titans, to being the backup of Michael Vick in Philadelphia. Young has seen a lot of ups and downs while in the NFL, but apparently it hasn't killed his sense of humor. In this Funny or Die commercial, Young emphasizes the importance of 'towels' in every day life. Check it out. She's a supermodel. That's all I know about Bar Refaeli, but I thank the fellas over at NESN.com for the post to get a brother hip to this hottie. Well done. I think folks would be disappointed if Factoid didn't post this video, I mean, it's a 26-year-old supermodel playing tennis in her underwear from crying out loud. I couldn't deprive any red blooded man (and some women) the right to see this for themselves. I really couldn't think of a title that would describe this video best, so I suggest watching it for yourself. The clip was taken form the Pride of Iowa senior all star game this weekend. You've got to love the creativity and flair for the unusual on this play. If I was the coach of the opposing team I would have been pissed my squad gave up an alley oop on the first play of the contest, but all star games are more about fun than who actually wins. Looking for a good hockey scrap are you? Then look know further than this next video featuring an insane brawl between members of the Philadelphia Flyers and the Pittsburgh Penguins. When it was all said and done, the penalty minutes for this skirmish totaled 50 and many expect fines and possible suspensions from the league. I'm someone who believes that the NHL should do away with the fighting. It's barbaric to have your stars basically engaging in legalized bar room brawls on the ice. The Thunder are as explosive as any team in the NBA. The young nucleus of talent racks up highlight reel plays every time they take the court, and the beat down they gave the Bulls Sunday was evidence of that. Here is one of the other signature plays from the game, as Russell Westbrook played distributor on this half-court alley oop to Kevin Durant. It's been a few weeks or more since the last Candy of The Day post, so I hope this will make up for lost time. Malicia Monroe is a Brazilian model out of Miami, Florida. Her website, maliciamonroe.com will debut soon, but until you can get more pics of this vixen, click on her name and check the Twitter account she has. You won't be disappointed. I promise. Partners in rhyme are ESPN and DJ Steve Porter these days. Take a look at the latest mix by Porter dedicated to the month that was March on ESPN's SportsCenter. It was a crazy month, and this sums it up quite well. I'm certainly a fan of naps, hell I love them, but I can't fall asleep while doing my job or hosting my radio show. It's bad for business. Bobby Knight on the other hand can get away with just about anything, so falling asleep on ESPN's College Gameday wasn't that big of a deal. It was good to see Digger have the General's back as he daydreamed of pick & roles and new sweaters for the fall. Old guys gotta stick together. And by the way, Jay Bilas is one cool cat! Check him out on Twitter if you aren't already. Real character. Shane Battier has always been known for his basketball IQ and selfless play. On Sunday against the Celtics he pulled off an inbounds play that we don't see very often, tossing the ball off of the back of Paul Pierce. Forget everything you've seen in terms of dunks in the NBA this season, because on Sunday afternoon OKC Thunder point guard Russell Westbrook took over the top spot. His victim was Chicago Bulls center Omer Asik. The thing that gets me about Westbrook, who has superior athleticism at the pg slot, is that he's just 23-years-old and has a lot of growth yet to come in his game. The Thunder are set.